Although I actually finished this card as a birthday card for a November birthday, I believe that it would also be suitable as a sympathy card. The poppy panel stamp by Kanban was stamped using Memento Tuxedo Black ink onto supersmooth card, then coloured using a red ProMarker (Poppy - suitably enough!). The bottom left poppy head was stamped out a further twice, and the middle poppy head once; coloured to match and decoupaged onto the main panel using foam pads for dimension. Once the panel was finished, I cut round it leaving a narrow border. To mat the distressed barb wire panels I cut two pieces of white card and one piece of red (14.3cm x 6.5cm). Before matting the right hand panel, red 0.25 inch satin ribbon was threaded through the tag (middle die from the Nellie Snellen Rectangle 1 set); and the ends were secured at the back before the addition of a silver peel-off sentiment. The three finished panels were then added to the front of the card blank with even spacing, and the poppy panel was glued across the left and middle panels. 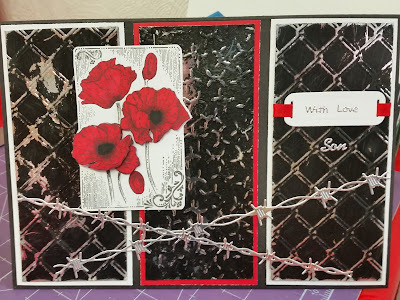 I cut the Cheery Lynn barbed wire borders from the same silver mirri-card that had been used for the backing panels, and glued them at angles across the bottom of the card as a finishing touch.